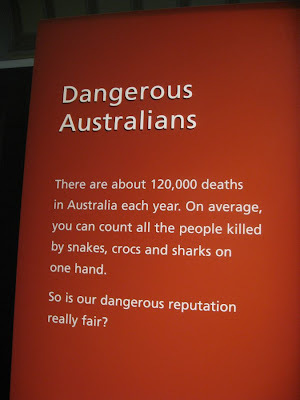 When I saw the posters outside of the Australia Museum for the exhibit "Surviving Australia," I thought maybe it was an exhibit about how humans survived all of the deadly creatures on this isolated continent, once known in Europe as "terra australis incognita" (unknown southern land). This was only part of the story. 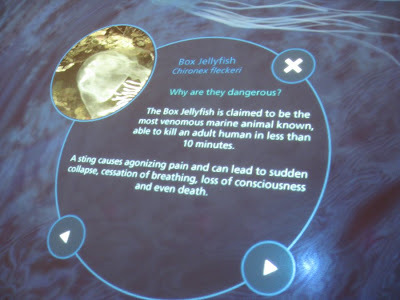 Upon entering the exhibit I realized it was more about how the creatures survived the deadly invading humans. 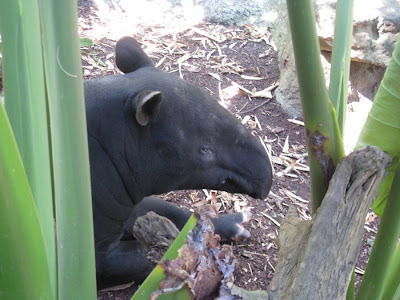 Extinct, endangered, and threatened animals were featured in varying media. 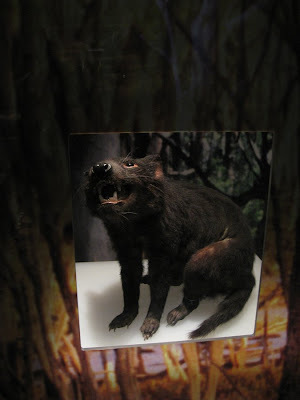 Threatened and endangered animals had taxidermied representatives. 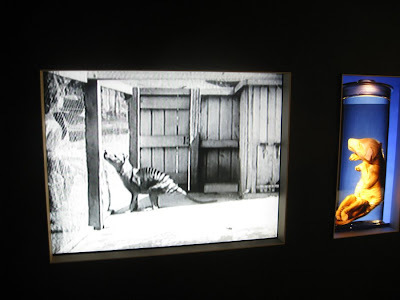 The extinct were mainly shown in illustrations, with the eerie exception of the Tasmanian tiger, of which there was archival film footage. There were life-sized recreations of megafauna, long extinct when Westerners arrived. 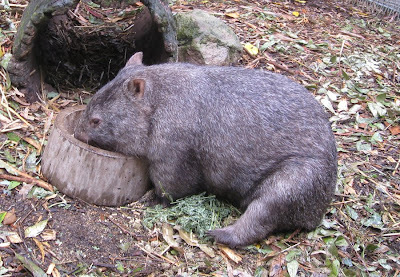 Giant wombat-like marsupials and enormous kangaroos (up to 10 feet tall) once roamed the continent. 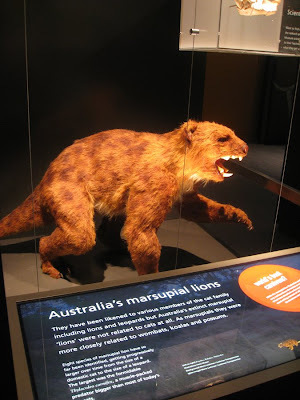 Thylacoleo, an extinct marsupial lion. 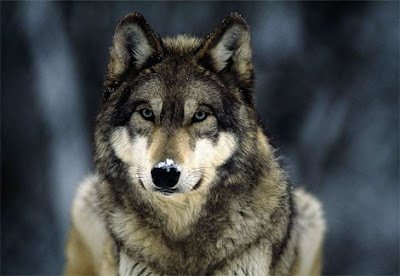 The fate of several animals was doomed upon the arrival of the white man. 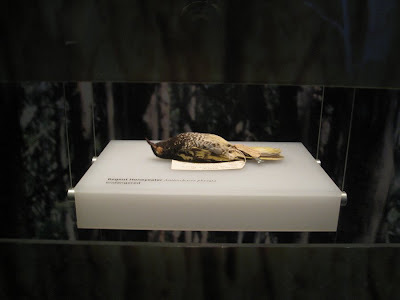 According to the exhibit, "in the last 200 years, over 50 vertebrate species and an unknown number of invertebrates and plants have disappeared from Australia -- presumed extinct." 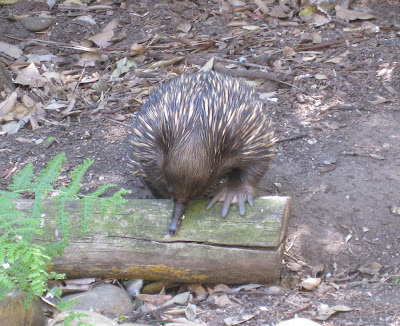 With habit destruction, introduction of foreign plant and animal species, and sometimes intentional extermination, the pig-footed bandicoot, several types of emu, kangaroo, and wallaby, and the Tasmanian tiger met their untimely end. Today, countless birds, amphibians, reptiles, and mammals are endangered or threatened because of humans. And Australia is sparsely populated compared with other continents (barring Antarctica), with about 21 million people covering the whole country. 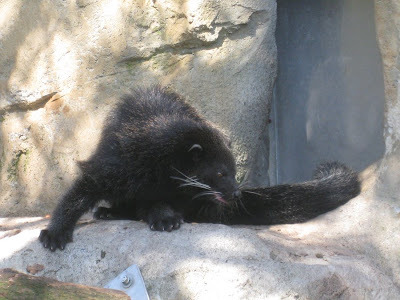 The endangered Tasmanian devil (I have a photo of a live one in my broken memory card). When land is cleared did you know that everything living is killed? Between 1972 and 2006 it has been estimated nearly 4 billion birds, mammals and reptiles have died as a result of land clearing in Australia. 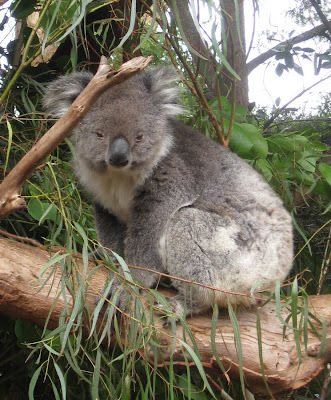 One-third of Australia's woodlands... has been destroyed. An estimated 50 percent of wetlands have been destroyed. Over three-quarters of Australia's rainforests have been destroyed. Alright, let's get down to the fun stuff -- the animals that are deadly to humans! I timed my trip to the museum perfectly, because the next day we were off to the tropical north, where all of these toxic creatures live. Saltwater crocs, chironex and irukandji box jelly fish, death adders -- they're all in Queensland's coastal regions. And let's not forget the great white shark! Huge, predatory Saltwater Crocodiles are one of Australia's most famous dangers. They're the world's biggest living crocodiles and can swim underwater at 30 kilometres per hour [18.6 mph] without causing a ripple. 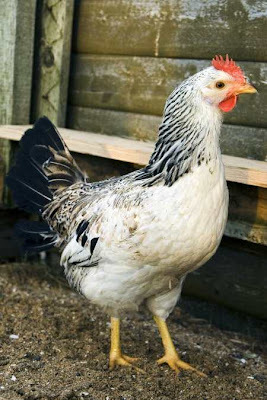 They can leap out of water fast enough to outrun a horse (over a short distance) and far enough to catch low-flying birds. It was kind of an exciting prospect to be able to possibly witness one of these creepy beings. I avoided going in the water for fear of deadly jelly stings. 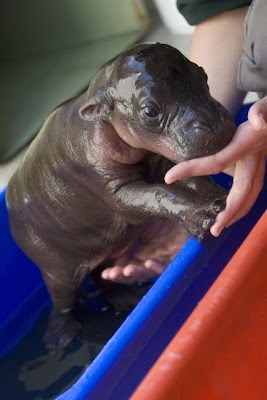 (I went for a horseback ride and even Rocky, my trusty steed, wouldn't take a dip -- maybe he knows something I don't!) Every branch brushing against my legs was a Sydney funnel-web spider waiting to intoxicate me. Alas, the scariest thing I came across was a little baby reef shark on the Great Barrier Reef -- and he was so scared of me that he darted away as soon as a I spotted him. But my boyfriend got to see a young saltwater crocodile on Bedarra Island -- I wonder where mama croc was?! 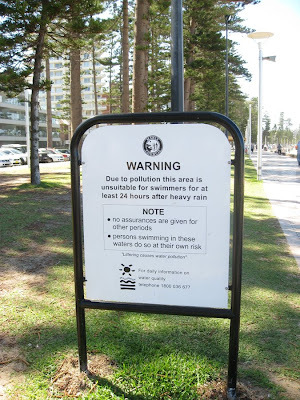 It's raining here in Sydney, which means that the oceans may be unfit for swimming for the next day or so. Like in other coastal cities (NY, LA), heavy rains wash all the trash from the streets into rain gutters and out to sea. Another reason to give a hoot and not pollute. 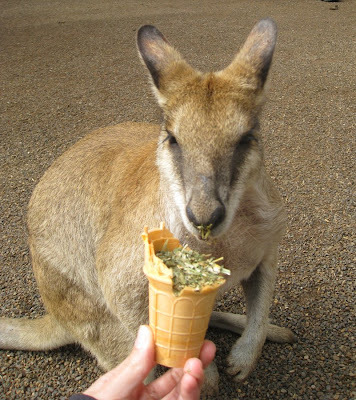 It's been quite an animal extravaganza for me in Australia. 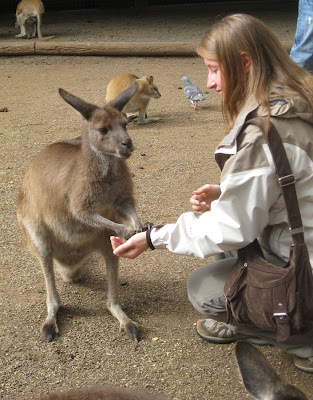 Flying foxes, various exotic birds, baby farm animals, and just yesterday, I got to pet a koala and feed a kangaroo. 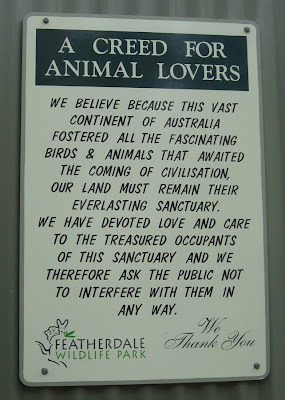 As part of an Eco Adventure tour (Dal Myles Tours), I got to visit Featherdale Wildlife Park where they boast one the most diverse private collections of Australian native wildlife. Since I was on a larger tour, I only got to spend an hour at the park. I think I could have spent the entire day. 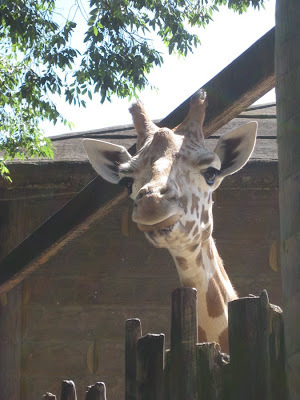 Here are a few of the animals I saw on my visit. Unfortunately, my memory card or reader is on the fritz so I couldn't download the rest of the photos, including pics of the Blue Mountains. Hopefully I can get that sorted out when I get home. 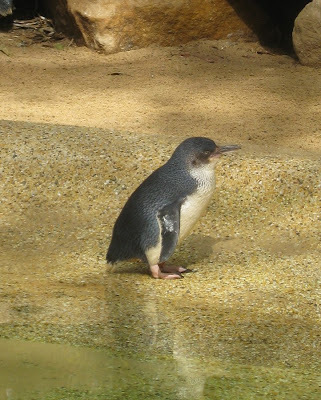 Yes, there are penguins in Australia. Africa, too. Some of the animals on the other memory card: albino wallaby, crocodile, various birds (including a white peacock), and a tasmanian devil. I've got to get those pictures! Yesterday we went to Paddington Market, a nice outdoor shopping market where local artists and designers peddle their wares. Before we left I checked out their website... it mentioned that every second Saturday baby farm animals are brought in for children to pet. Too good to pass up! Since I'm a big kid at heart, I paid the $5 to enter the mini petting zoo. I got to feed the calf and lambs and pet the goats. Bunnies, a spotted piglet, guinea pigs, ducklings, doves, and chicks were also there to ooh and aah over. 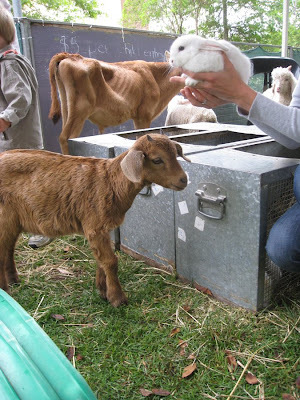 All of the animals were from Bowral Farmyard Friends, a service run by Malcolm Dowling that introduces young city kids to farm animals. I like to pack lightly when I travel, meaning what I can't carry on stays at home (in most cases). So that means I've got to comply with TSA regulations and carry a clear quart-sized bag with all of my liquid toiletries each under 3 ounces in volume. I went to Whole Foods with the intention of picking up Badger SPF 30, but it only came in a 4 ounce (unlike the one sold here). 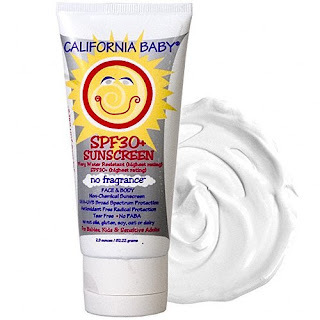 But then I spotted California Baby SPF 30 (fragrance free). I had read that it was a safe choice according to Environmental Working Group's (EWG) Skin Deep cosmetic safety database. 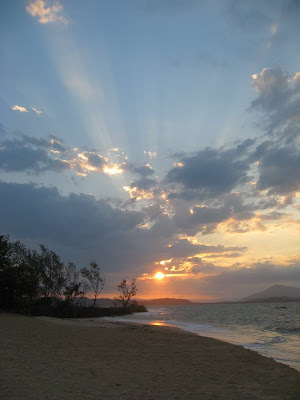 The ultimate test for a sunscreen's effectiveness has to be under Australia's beaming hot sun. 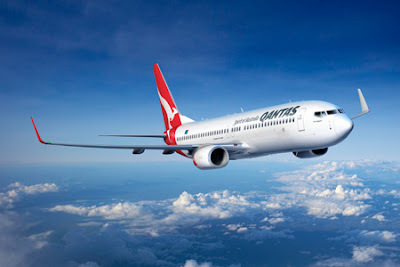 After all, the hole in the ozone layer flirts with the Australian continent. So here's what I think about Cali Baby. A little bit goes a long way. If you use too much, you'll be white as a ghost. But if you rub it in good, there's only a subtle whiteness. Zinc oxide is a physical sunblock as opposed to the chemical blocks which have in some instances been shown to be carcinogenic and carry other health risks. (kinda defeats the purpose, no?). Bottom line: The stuff works. Yesterday I put it on my face and arms and walked around all day. Today I spent a couple of hours at the beach and it's pretty safe to say my skin was unscathed by the powerful Aussie sun. I definitely didn't burn and I'm not sure I got much color really. It is a bit greasy, so I wouldn't recommend it for everyday use, but it's great for a day at the beach or poolside. Read more about EWG's recommendations for safe sunscreens. 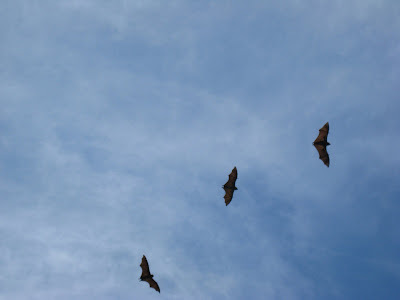 it's a bird, it's a plane... it's fruit bats! 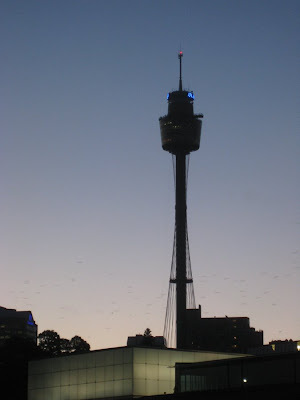 At dusk on the day we arrived in Sydney, I saw what I thought were birds flying around the city, filling the skyline (see little specks in picture above). "I think those are bats," one of my travel companions said. "No way!" I didn't believe there could be so many. 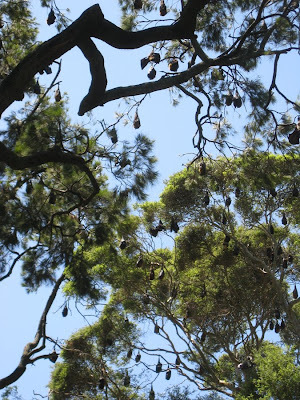 She said that she saw them in a tree at the nearby Royal Botanic Gardens. 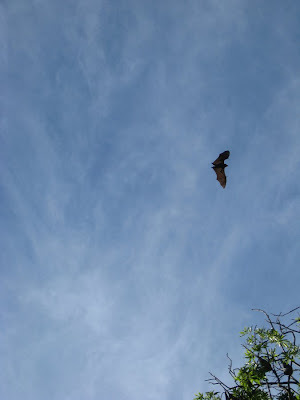 We had heard that there were big bats in the gardens, but I didn't believe it. 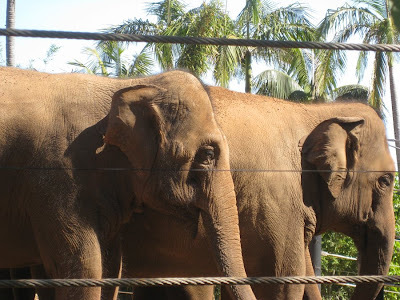 The prospect of seeing them during the day was too exciting for me. Named because of its fox-like face, the Grey-headed Flying-fox (Pterus poliocephalus) is one of the largest species of bat in the world, weighing up to 1 kilogram [2.2 lbs] with a wingspan of up to 1.5 metres [nearly 5 feet]. 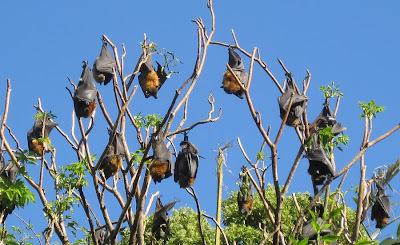 Flying-fox are very intelligent, they have large eyese and oval ears capable of acute hearing. 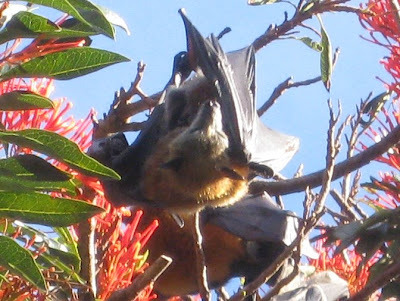 Grey-headed Flying-fox are distributed along the eastern coast of Australia from Rockhampton in the north to western Victoria in the south. That's not fruit... it's bats! 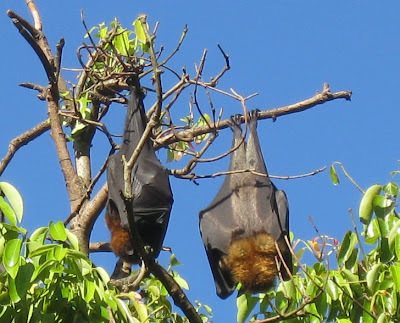 Major threats to the survival of Flying-fox are destruction of their habitats and roost sites, and clearing and fragmentation of their feeding sites. Loss of these areas has a direct impact on Flying-fox populations. 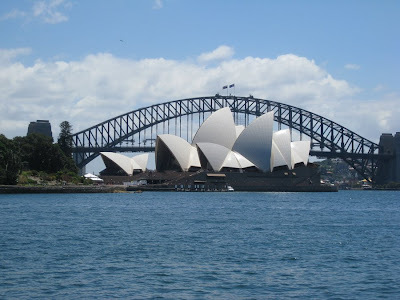 The colony size in the Royal Botanic Gardens Sydney varies between 1000 and 8000 individuals depending on the time of year and food availability both in the immediate area and along the eastern coast of Australia. 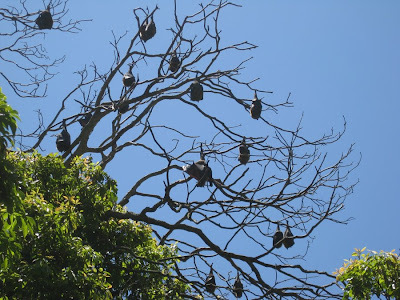 Read more about Flying-foxes (fruit bats). The Bicycle Film Festival celebrates the bicycle. We are into all styles of bikes and biking. If you can name it - Tall Bike Jousting, Track Bikes, BMX, Alleycats, Critical Mass, Bike Polo, Cycling to Recumbents - we've probably either ridden or screened it. What better way to celebrate these lifestyles than through art, film, music and performance? We bring together all aspects of bicycling together to advocate its ability to transport us in many ways. Ultimately the Fest is about having a good time. It's the great environmental debate - a free youth-orientated symposium hosted by our favourite scientists, Adam Spencer and Dr Karl Kruszelnicki. 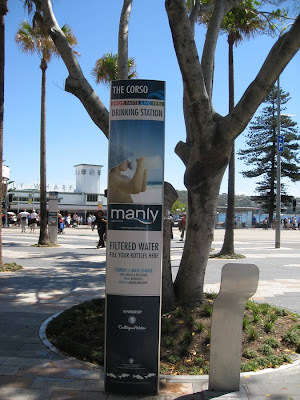 They'll be exploring issues on Sydney's water resources and sustainable future. Over this weekend you will learn how to apply pro-active, sustainable design techniques to your immediate environment - whether you live in an inner city apartment, a quarter-acre block, or a rural property. Covering organic food production, system design (and re-design) for comfort and lower energy consumption, and ideas on how to approach a sustainable and positive community existence within your neighbourhood. This course will be taught by Nick Ritar, an award-winning educator of community technologies and strategies for communication, and co-founder of Milkwood Permaculture, providing practical, ecological, do-able solutions for sustainable living and development. All previous editions of this course have sold out quick smart - so come along, and start your process of skilling-up for adaptation in a changing world. What comes to mind when you hear the word "refugee"? Political exiles? People escaping war, genocide? What about ecological exiles? Ideology is not the only thing that tears people away from their land, their family, their culture. Climate change, and the calamities it brings, is already forcing people to migrate en masse. This isn't something that only affects those in developing nations. 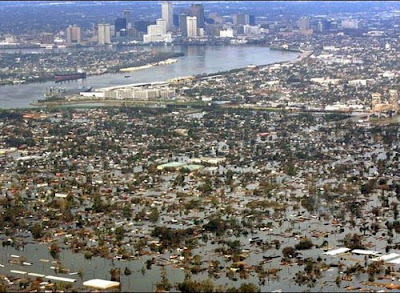 Hurricane Katrina, one of the most devastating storms in US history, rendered thousands homeless in our own nation. Both man and nature contributed to this catastrophe. Poor planning and plain ignorance -- mixed with warmed gulf temperatures -- fueled what might have been a weaker storm. Currently, thousands of people are still displaced from their homes. They are scattered across the country, some never to return home. Contact representatives to bring Katrina refugees home. Intensified storms due to warming sea surface temps are just one reason for human relocation. Other changes in our relationship with water will create a massive population of climate refugees. These shifts may include rising sea levels, stronger tropical cyclones, the loss of soil moisture under higher temperatures, more intense precipitation and flooding, more frequent droughts, the melting of glaciers and the changing seasonality of snowmelt. Combined with the human-induced depletion of groundwater sources by pumping, and the extensive pollution of rivers and lakes, mass migrations may be unavoidable. We see these changes happening already. Those who are fortunate can adapt. Droughts in the West are compelling cities to implement toilet to tap water treatment or consider desalination in order to supply people with water. 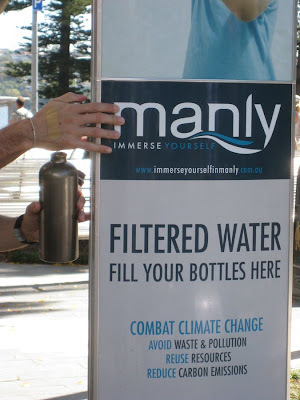 In Australia, plans are under way to build a controversial desalination plant. But in other parts of the world, where there is a lack of infrastructure and resources, millions will be forced to move. The Wikipedia definition of environmental refugee. If you haven't been to TripAdvisor lately, you might not know they're running a poll to tell them where to donate $1 million. There are 5 non-profits in the running, including Conservation International and The Nature Conservancy. The deadline is quickly approaching -- this Sunday, November 9th -- so get on over there and vote! In this video, actress Rosario Dawson tells not to go to TripAdvisor to vote... and then has a change of heart. 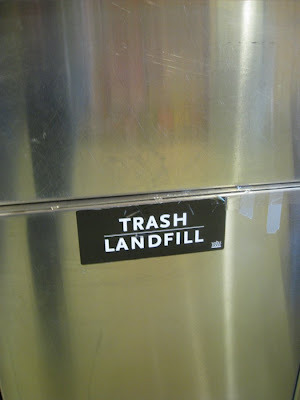 what we throw away doesn't just go away. This morning when I went to (well, attempted to) vote, I wish I had my camera. The line went out of the school building where the polls are, down the block, around the corner and almost all the way down a full avenue block. 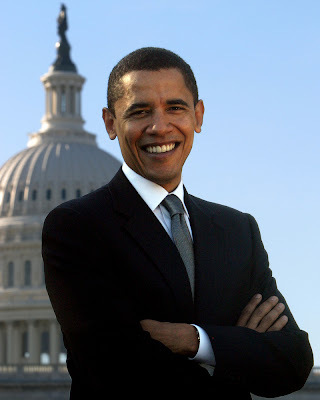 I've never seen anything like it... the last presidential election I was able to go right into the building, right away. I like to vote early in the day to get it out of my system, but I had to come in to work. If I had waited, it would have taken almost an hour and a half just to get to the door of the building. What I wonder is this: why isn't election day a national holiday? It's such an important event. 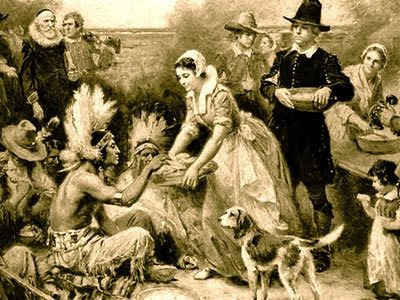 Many people have off for Columbus Day, honoring someone who didn't even really discover America -- he thought he was in India for goodness' sake. But on the one day where people get to exercise one of their greatest rights, a right that was literally fought for by this country's founders, by the suffragists, by people of color, many people cannot wait on a long line because they have to get to their jobs. No time to make a phone call to remind friends and family members to vote tomorrow? Pop on over to txt out the vote to send out a quick note to your loved ones.